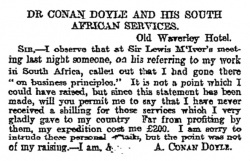 Dr. Conan Doyle and his South African Services is a letter written by Arthur Conan Doyle published in The Scotsman on 3 october 1900. Sir, — I observe that at Sir Lewis McIvor's meeting last night someone, on his referring to my work in South Africa, calls out that I had gone there "on business principles." It is not a point which I could have raised, but since this statement has been made, you will permit me to say that I have never received a shilling for those services which I very gladly gave to my country. Far from profiting by them, my expedition cost me £200. I am sorry to intrude these personal details, but the point was not of my raising. This page was last edited on 24 September 2018, at 23:42.